Dashing Diva’s creative educator Masako Sasaki used an array of Dashing Diva products to complete this nail design called Holiday Muse. Dashing Diva’s creative educator Masako Sasaki used an array of Dashing Diva products to complete this nail design called Holiday Muse. Most of the design elements featured in this look can be found in Dashing Diva’s newly launched DesignCenter, a comprehensive display for distributors. The company is looking to expand it in the New Year to include more products. 1. After sizing the Virtual Nail in either Round or Almond to fit your client’s nail type, apply it using Virtual Bond adhesive tabs and put on two coats of ColorFX in Take a Bite. 2. Size and cut the DesignFX in Plaid to Meet Ya to your client’s nail. 3. Cover the cuticle portion of the nail only to create a half-moon design. 4. 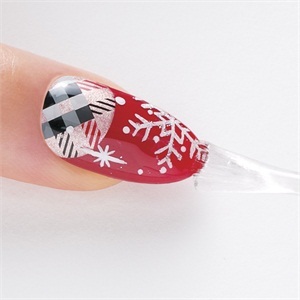 Paint snowflakes and small dots with a finely tipped brush using acrylic paint. 5. Take a thicker brush and apply a small amount of Dashing Diva Base Gel with silver glitter and trace along the lines of the snowflake. Cure the design for a few seconds under the Dashing Diva LED LightPod so the glitters can set. 6. Apply a coat of Dashing Diva Base Gel over the entire nail, capping the free edge. Cure for 45 seconds under the LED light. 7. Apply a coat of Dashing Diva Top Gel over the entire nail, capping the free edge. Cure for 45 seconds under the Dashing Diva LED LightPod. Cleanse the nail with alcohol to finish. For more information, go to www.dashingdivapro.com.